CASSINI - [Title page] Nuovo Atlante geografico universale. . .
CASSINI, C.M. - [Title page] Nuovo Atlante geografico universale. . .
[Title page] Nuovo Atlante geografico universale. . . - CASSINI, C.M. 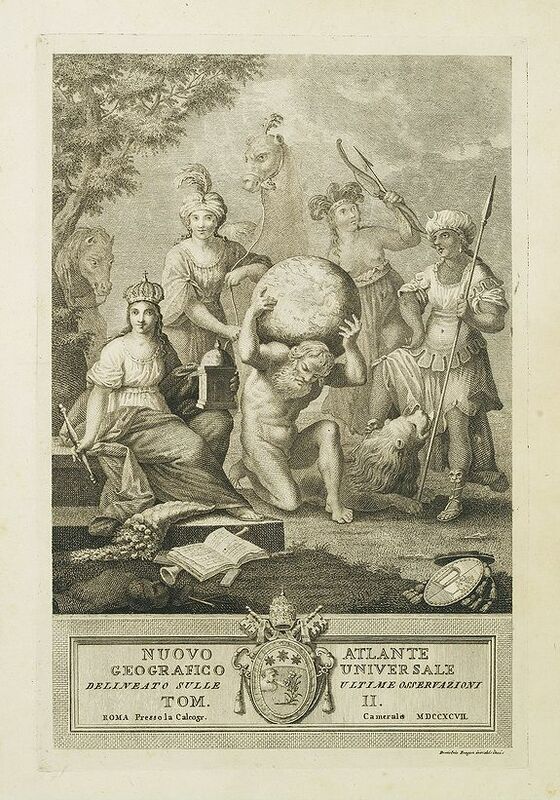 Title : [Title page] Nuovo Atlante geografico universale. . ..
Map maker : CASSINI, C.M.. Date : Rome, 1792 - 1801. Size : 14.5 x 9.6 inches. / 36.9 x 24.5 cm. Description :Attractively engraved frontispiece. Atlas carries the world on his shoulders, four figures representing the continents, while Europe sits enthroned in the foreground. Title page of 'Nuovo Atlante Geografico Universale', by Giovanni Maria Cassini, a Somasco monk. He was geographer and cartographer but he was also good at engraving architectural items and perspectives - he was one of the best disciples Giovanni Battista Piranesi had. Moreover, Cassini was one of the last artists to engrave spheres in the XVIII century and his globes were quite famous and widespread, and realized the most important Italian Atlas of the XVIII century. Condition : Right margin a little browned. Upper and right margin minor browned can easily be matted out when framed.